By a narrow margin, designer Antoine Bauza’s 7 Wonders is crowned the champion. 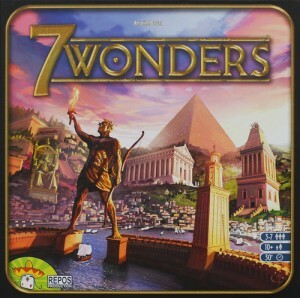 7 Wonders has passed by 63 other games to take home the trophy! Congrats and thanks to all who played along! 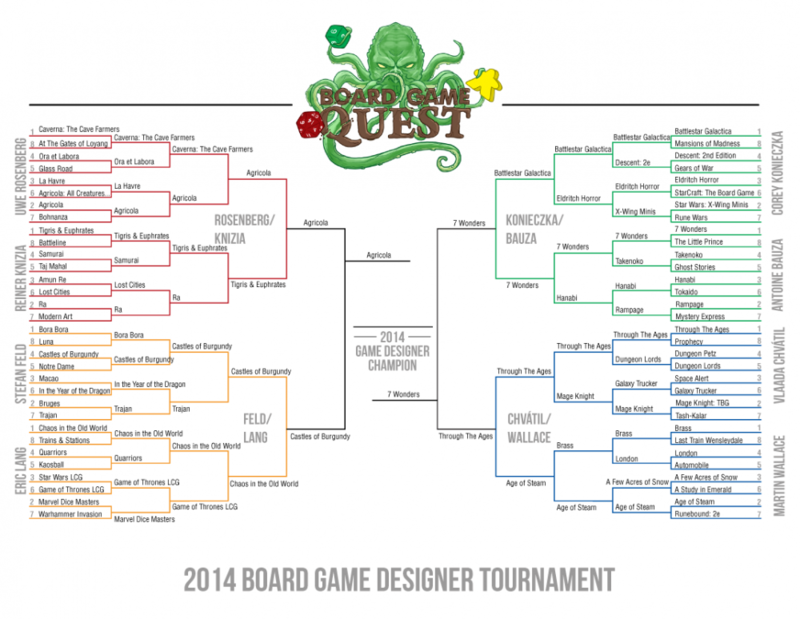 For the past month or so we’ve been running our Board Game Designer Tournament. For those who haven’t been following along, we are celebrating our 2 year anniversary and decided we should give a game away to our awesome readers. Since you are clearly the best readers we could ever hope for, we needed to find one of the best games to give you. 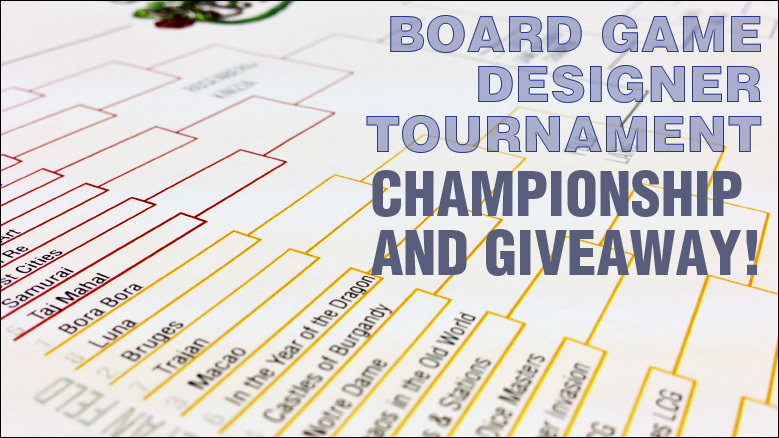 Enter the Board Game Designer Tournament. We started with a field of 64 games from 8 high profile board game designers. It was up to you to vote for the winners along the way. Thousands of votes were cast and along the way, 6 of those designers had their games fall out of contention. This leaves us with the final two. 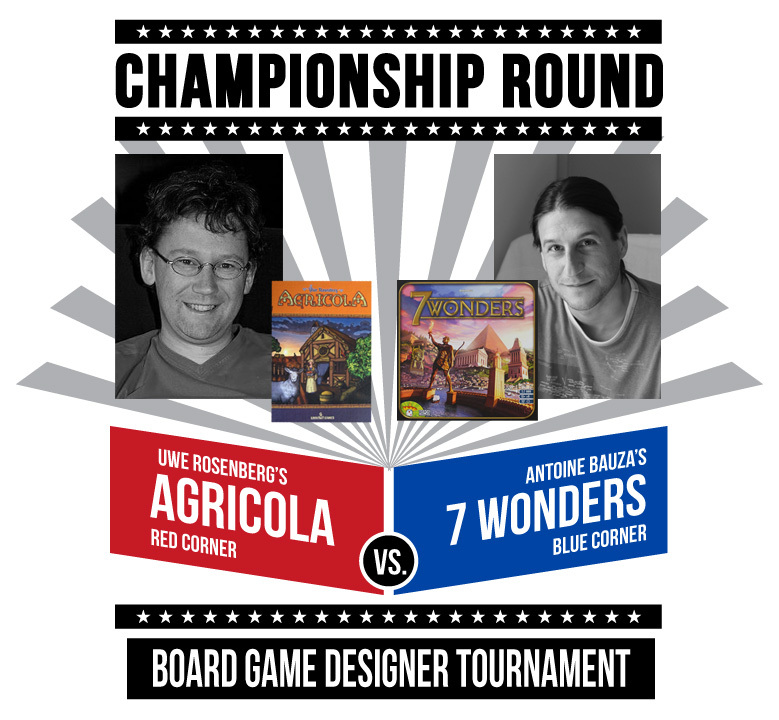 Only one of these designers can wear the crown and be the champion of the Board Game Designer Tournament. The other designer will join the ranks of Reiner Knizia, Stefan Feld, Eric Lang, Corey Konieczka, Vlaada Chvátil and Martin Wallace on the sidelines. If you want to know the path these two games took to get here, then look to the bracket below. But for now, it’s time to vote for a winner. Below is the voting ballot where you can make your selection, but there is also the giveaway form. As I mentioned earlier, we are going to give away one of these two games to a lucky winner! All you have to do is vote to be entered. It’s just that easy. Of course, there are other ways to earn additional entries if you want to increase your chances. And fear not, if you already own the game from the winner designer, we might just let you receive the runner up instead (but no telling the winner). So vote for which game you think should reign supreme and may the best game win! You have until Tuesday, August 5th to vote and enter the contest, so get to it. Enter to Win the Champion! Give us a heart on Board Game Links. These wouldn’t have been my picks to reach the top, but it’ll be interesting to see what comes out ahead. Oh yeah, my bracket got destroyed a while ago. Cool, thanks for the tournament and the giveaway! Both are great games, 7 wonders currently taking the lead! Hoping for 7 Wonders to come out on top! My bracket was busted ages ago! Feed the family, grow the family! Go Agricola! I had a hard time choosing between these two. Both awesome games! I hope 7 Wonders wins! Such an amazing game. Good idea, competing designers. I hope you have something as original next year – looking forward to it. More like competing various designers’ top games. This duel would be more interesting if you could rank 3 games of both in a list of 6. Whooo farming games. Go Agricola! Nice to see my choice (7 wonders) currently in the lead. Will be cheering for 7 Wonders! Who does all of your sweet graphics/images for this site? Incredibly excited for this contest! I’ve never played either game, but I seem to hear more about Agricola. I’d love to try these modern classics! Tough call, but I have to give an edge to the complexity of Agricola! Thanks for the contest! I like Agricola more but the shorter playtime of 7 Wonders is what puts it ahead for my vote.